Charlotte Orr is a third year Medical Humanities PhD researcher at the University of Glasgow. Her research focuses on the writings and reception of physician-writer Sir Ronald Ross (1857-1932). Recently her work was featured on BBC Radio Scotland, as part of the Time Travels’ episode ‘Charismatic Characters and Wings to War’. 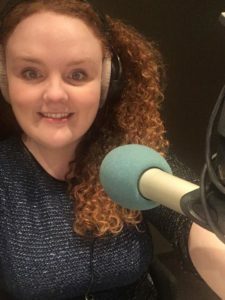 Last month, I was fortunate enough to chat about my research on BBC Radio Scotland’s show, Time Travels. This blog will give a brief overview of the process of being interviewed for the show; provide helpful tips from the BBC radio producer, Louise; and share my advice on how to convert years of research into titbits of intriguing and accessible information for the general public. If I haven’t met people in real life or heard them present at conferences, sometimes I use Twitter as a proxy. Is this person tweeting about their research, are they tweeting interesting things, have they linked to a paper or blog or chapter they’ve written so I can have a look at what they’re doing? If you haven’t already, when using Twitter, make sure clearly to link to any open access writing that you may have. This is easily done by editing your twitter profile appropriately; in the space to insert a URL, you can add a link to your most recent article/blog. Thinking of the target audience allowed me to hone in on parts of my research that would be valuable to listeners. Since I was participating in a history programme on BBC Radio Scotland, I could safely assume that incorporating snippets of Scottish history was a top priority: Did Ross have family in Scotland? Did he visit Scotland regularly? Was he friends with any prominent Victorian Scots? I made my work on Victorian medicine more relatable by comparing it with experiences of modern-day medicine likely familiar to the audience: Had they too come across an arrogant doctor? Had they also assumed they had known better than a doctor after reading up on their symptoms? Finding out more about your audience definitely helps you rid your work of extraneous information. Louise was more than happy to send me the questions I was going to be asked in advance of the interview. However, her top advice was DO NOT arrive at the studio with prepared answers that you plan to read off the page. Chatting about your research on the radio should be as relaxed and informal as chatting to a stranger at the pub. Louise noted that listeners want to hear ‘the most interesting, moving, strange or funny things which might make them see why it’s such a brilliant subject’. My advice for prepping for the interview would be to write bullet-pointed answers to each question, practice your answers with whoever will listen to them (and encourage your listener to ask follow-up questions of their own making), and (if you’re a nervous speaker) sit with the short bullet-pointed answers in front of you for comfort (not for reading!) while you have your interview. Once you get used to the unusual equipment around you, having a chat with someone who is excited to know all about your work is a joy! I hope this blog has given you a few pointers on how to navigate a media interview. If you have any questions, feel free to get in touch!